Last time, we looked at the Hebrews writer’s note of encouragement to his brothers and sisters, in which he told of his hope for better things for them (and us) than he had spoken of in his warning that it is impossible for those who have tasted of the heavenly gift and then fall away from faith to be restored to repentance. He reminded his readers of the patience and persistent faith of Abraham to whom God had sworn an oath of promise, and encouraged them (and us) to remain steadfast as Abraham was – continually growing in our faith. The writer now takes up once more the subject of Jesus’ role as our High Priest who continually makes intercession for the people before the throne of God. The writer first broached this subject near the end of Hebrews 4, quoting Psalm 110:4, calling Jesus “a high priest forever according to the order of Melchizedek,” but quickly changed the subject, saying that his readers had become too “dull of hearing” for us to comprehend that statement. Having promised that he would have much to say on the topic, he now returns to it here at the end of Hebrews 6. 6-19This hope we have as an anchor of the soul, both sure and steadfast, and which enters the Presence behind the veil, 20where the forerunner has entered for us, even Jesus, having become High Priest forever according to the order of Melchizedek. 7-1For this Melchizedek, king of Salem, priest of the Most High God, who met Abraham returning from the slaughter of the kings and blessed him, 2to whom also Abraham gave a tenth part of all, first being translated “king of righteousness,” and then also king of Salem, meaning “king of peace,” 3without father, without mother, without genealogy, having neither beginning of days nor end of life, but made like the Son of God, remains a priest continually. 4Now consider how great this man was, to whom even the patriarch Abraham gave a tenth of the spoils. 5And indeed those who are of the sons of Levi, who receive the priesthood, have a commandment to receive tithes from the people according to the law, that is, from their brethren, though they have come from the loins of Abraham; 6but he whose genealogy is not derived from them received tithes from Abraham and blessed him who had the promises. 7Now beyond all contradiction the lesser is blessed by the better. 8Here mortal men receive tithes, but there he receives them, of whom it is witnessed that he lives. 9Even Levi, who receives tithes, paid tithes through Abraham, so to speak, 10for he was still in the loins of his father when Melchizedek met him. 11Therefore, if perfection were through the Levitical priesthood (for under it the people received the law), what further need was there that another priest should rise according to the order of Melchizedek, and not be called according to the order of Aaron? 12For the priesthood being changed, of necessity there is also a change of the law. 13For He of whom these things are spoken belongs to another tribe, from which no man has officiated at the altar. There is certainly a great deal to consider in this meaty passage. Digesting it will require the full measure of our spiritual discernment, by the grace of God. The old bromide asks how one goes about eating an elephant, with the obvious answer, “one bite at a time.” So let’s begin. Recall, from our previous study in Hebrews 6:7-18 we looked at the promise God made to Abraham which He sealed by an oath sworn by Himself, since there is none greater by whom God could swear. In summing up that discussion the Hebrews writer spoke of the strong consolation which we who have fled [to Jesus] for refuge to lay hold of the hope set before us may ourselves also find in that promise God made to Abraham. The writer now expounds exactly what that hope set before us is – eternal life in Heaven with our Father and His Great High Priest – Jesus. Once again, we see the writer using symbolism which would certainly have struck a chord in the hearts of his Hebrew readers. The veil to which the Hebrews writer refers here in Hebrews 6:19 is of course the heavy curtain that God instructed Moses to construct between the Holy place and the Most Holy Place. This veil was symbolic of the separation between God and man due to our sin when we fell from grace in the Garden of Eden. The Ark of the Testimony inside the Most Holy Place was symbolic of God’s Holy Presence from which man’s sin separates us. God also gave specific direction in the Law of Moses pertaining to how the Ark was to be placed inside the Most Holy Place, and how it was to be covered and moved by the Levites during the wandering of the Israelites in the wilderness. After the Ark was filled with the tablets of the Law, the bowl of manna, and Aaron’s rod which blossomed and after it had been consecrated, only the High Priest – Moses’ brother Aaron and his descendants – could ever touch the Ark, and then only to cover and uncover it. Only the ministers of the tribe of Levi were allowed to carry the Ark from place to place, and they were allowed to do so only while the Ark was covered. When the tabernacle was resting, only the High Priest was allowed to enter the Most Holy Place, and only once a year on the Day of Atonement – יוֹם כִּפֻּר yowm kippur (Leviticus 16). Aside – Hebrews 6:19 gives an opportunity to point out an important aspect of Bible study that disciples of Jesus should be on the lookout for. When a word is printed in italic typeface in many printed English translations of God’s Word, it can mean one of two things. Either the word, phrase, or passage in the italic font is a quotation from elsewhere in the Bible, or the word, phrase, or passage is not found in the original language (Greek, Hebrew, or Aramaic) manuscripts. Most often, such words have been inserted by the translators in order for the translation to make grammatical sense in the target language, whereas the inserted words are not needed by the grammar of the original language. We find two examples of such inserted words here in the NKJV translation of Hebrews 6:19 – the word hope and the phrase the Presence. Obviously, such inserted words are required by the translators much more often in a word-by-word type of translation, such as the KJV or the NKJV, than they are in a concept-by-concept translation such as the NIV, or in a paraphrase/commentary, such as The Amplified Bible or the NLT. So the serious student of the Bible should keep a variety of translations on hand, or use an online tool that provides multiple translations, and be on the lookout for words and phrases inserted by the translators. Needless to say, I personally recommend using a word-by-word translation primarily. Here in the NKJV rendering of Hebrews 6:19, the word hope has been inserted by the translators as a reminder that the verse is a continuation of the writer’s thought found in the previous verse about the hope of eternal life, which believers have in Christ. The phrase the Presence doesn’t occur in the original Greek. Nor is it strictly speaking required for the English translation to make grammatical sense. In fact, of the translations I had available for comparison, only the KJV and NKJV contain the phrase here in this verse. Nevertheless, I personally like the way the NKJV renders the verse, because it is a reminder that behind the dividing curtain between the Holy Place and the Most Holy Place in the Hebrew tabernacle and later in the temple of Solomon, was where the Ark of the Covenant was placed, and that when the Ark was put in this place, and properly consecrated in accordance with the Law of Moses, the very Presence of God descended on the place and rested on the Mercy Seat which covered the Ark. 33And he raised up the court all around the tabernacle and the altar, and hung up the screen of the court gate. So Moses finished the work. Aside: The Hebrew word שכינה‎ šekīnah is often used to refer to the glory of the LORD which descended onto the Mercy Seat in the Tabernacle and in Solomon’s Temple. However, surprisingly this word, which is actually a verb meaning to settle or to dwell isn’t found in the Hebrew Old Testament at all. It was introduced in reference to God’s glory filling the Tabernacle and temple in later rabbinical writings such as the Talmud which are not part of the Biblical canon. Notice that I have been careful to say that the Presence of God descended on the Ark in the Tabernacle and later in Solomon’s temple in Jerusalem not the second and third temples in Jerusalem. The last mention of the Ark in the Old Testament history books is in 2 Chronicles 35 during the reign of Josiah – the last righteous king of Judah – who commanded the Levites to restore the Ark to its rightful place in the Most Holy Place inside the temple of Solomon. Shortly thereafter, the King of Egypt came up against Jerusalem and plundered the temple. Perhaps this is where the idea that the Ark may be somewhere in Ethiopia came from. Not too long after that, the army of King Nebuchadnezzar of Babylon destroyed and plundered the temple, and carried the remnant of Judah into captivity. There is no mention of the Ark in Ezra or Nehemiah in which the temple and the walls of Jerusalem were rebuilt when the remnant of Israel returned from the Babylonian captivity. Nor is there any mention in those accounts of the glory of God descending upon the second temple when it was consecrated. Of course, there is also no mention in the New Testament of either the Ark or the glory of God descending on the temple of Herod the Great which stood in Jerusalem during the ministry of Jesus. We should be very careful about assigning any particular spiritual significance to the temple building or to the physical Ark of the covenant. There was nothing magical or mystical about either the Ark’s box, the cherubim carved on its cover (Mercy Seat), or the physical contents of the Ark – the tablets of the Law, the bowl of manna, and Aaron’s rod which budded. What makes the temple and the tabernacle spiritually significant is not its physical makeup, but the devotion of the children of Israel to God in worship there, and their commitment to honor and obey His commandments. In this, I think that it is significant that we don’t see a recorded instance of God’s glory dwelling in the temple once the people fell into idolatry late in the reign of Solomon. The Ark, the tabernacle, and the temple were all only human constructions – albeit under instruction from God Almighty Himself by the word of Moses. The Indiana Jones movie Raiders of the Lost Ark notwithstanding, these articles had and have no power in and of themselves, except that they act as the symbols that God intended them to be, serving to remind us of our separation from the holiness of God through our sin. Indeed, the veil spoken of here in Hebrews 6:19 is truly symbolic of death itself – the wages of our sin, and the ultimate and final separation from God. So far, Hebrews 6:19 is telling a pretty dismal story. Our sin separates us from God, and brought death itself into the world. But, praise God! That’s not the end of the story. God Himself saved the Day when He came into the world in the flesh of Jesus, and died on the cross to redeem us out of the death we brought upon ourselves through sin. Now, just as the high priests of Israel entered behind the symbolic veil of the tabernacle and temple into the Presence of God who dwelt between the cherubim carved into the mercy seat which covered the ark of the testimony to make atonement for the people, even so Jesus has returned to the Presence of His Father in Heaven, having passed through the veil of His death on the cross into the resurrection life which He spoke of to Lazarus’ sister Martha. When Jesus died on the cross, He entered into death once for all mankind, taking on God’s righteous punishment for our sin. In so doing, Jesus removed the barrier that separated us from God. At that very moment, the veil of the temple which symbolized that separation was torn. The symbol of our estrangement from God was no longer needed. 50And Jesus cried out again with a loud voice, and yielded up His spirit. Now, having conquered death by His resurrection, Jesus has once more taken up His rightful place at the right hand of the Father (Hebrews 1:3), where He now serves as our Great High Priest. We have discussed at length, the concept of Jesus’ priestly ministry in some of our previous studies in Hebrews, so we won’t rehash those discussions here. The writer now once more returns to this recurring theme in his letter, to expand upon the discussion of the idea first mentioned by David in Psalm 110 – Jesus’ relation to Melchizedek, the mysterious figure whom Abraham met Genesis 14. The name – Melchizedek – appears in only a single verse in the Word of God outside of the letter to the Hebrews and David’s reference to him in Psalm 110:4 which the Hebrews writer quotes three times. Abram had not yet been renamed Abraham by God nor had God given him the promise of an heir (Isaac) at the time he met Melchizedek upon his return from rescuing his nephew Lot, and the King of Sodom from the four kings from the east. 8And the king of Sodom, the king of Gomorrah, the king of Admah, the king of Zeboiim, and the king of Bela (that is, Zoar) went out and joined together in battle in the Valley of Siddim 9against Chedorlaomer king of Elam, Tidal king of nations, Amraphel king of Shinar, and Arioch king of Ellasar—four kings against five. 10Now the Valley of Siddim was full of asphalt pits; and the kings of Sodom and Gomorrah fled; some fell there, and the remainder fled to the mountains. 11Then they took all the goods of Sodom and Gomorrah, and all their provisions, and went their way. 12They also took Lot, Abram’s brother’s son who dwelt in Sodom, and his goods, and departed. 13Then one who had escaped came and told Abram the Hebrew, for he dwelt by the terebinth trees of Mamre the Amorite, brother of Eshcol and brother of Aner; and they were allies with Abram. 14Now when Abram heard that his brother was taken captive, he armed his three hundred and eighteen trained servants who were born in his own house, and went in pursuit as far as Dan. 15He divided his forces against them by night, and he and his servants attacked them and pursued them as far as Hobah, which is north of Damascus. 16So he brought back all the goods, and also brought back his brother Lot and his goods, as well as the women and the people. This passage makes a fascinating study of its own, since many of the place names are familiar from the Genesis accounts immediately following the great flood, and because of the continuing mystery surrounding the precise locations of Sodom, Gomorrah, and Zoar. The battle of the Valley of Siddim must have taken place along the shore of the Salt Sea (Dead Sea) somewhere, but the exact location of the battle remains a mystery. But delving into those mysteries won’t get us closer to finding out exactly who Melchizedek is, so let’s press on. As the writer points out in Hebrews 7:2, the name Melchizedek – מַלְכִּי־צֶדֶק Malkiy-Tsedeq – is a compound of two Hebrew words – מֶלֶךְ melek, meaning king, and צֶדֶק tsedeq meaning righteousness. His very name brings to remembrance the Messianic prophecy of Jeremiah. ​​He shall execute judgment and righteousness in the earth. ​​And Jerusalem will dwell safely. The Hebrews writer then goes on in Hebrews 7:1-2 to give a synopsis of Abram’s encounter with Melchizedek found in Genesis 14. This blessing of Abram by Melchizedek should rightly be put in red letters, since I believe that Melchizedek is none other than Jesus Himself, appearing in the flesh of a man to Abram who was called the “friend of God” (2 Chronicles 20:7, Isaiah 41:8, James 2:23). The Hebrews writer makes a convincing argument for this belief over the next few verses. Notice first that Melchizedek is called both “king of Salem” and “the priest of God most high.” The Hebrews writer points out that “king of Salem” (in Hebrew מֶלֶךְ שָׁלֵם melek Shalem) means king of peace. This is reminiscent of Isaiah’s well-known Messianic prophecy. ​​And the government will be upon His shoulder. ​​Everlasting Father, Prince of Peace. ​​From that time forward, even forever. Aside: As we mentioned when we studied God’s promise to Abraham at Mt. Moriah last time, שָׁלֵם Shalem was the name of Jerusalem during the time of Abraham. The name Jerusalem (Hebrew יְרוּשָׁלַם Yĕruwshalaim) is a compound name composed of the Hebrew word יָרָה yarah meaning to throw, shoot, cast, or pour and the word שָׁלֵם Shalem which means peace, as we have already seen. Recall also that Jerusalem is also known by the name Zion (Hebrew צִיּוֹן Tsiyown), meaning parched or sunny place. This is reminiscent of another prophecy of Isaiah. Recall that after Solomon fell into idolatry late in his reign, God had determined to divide the kingdom, giving the land of ten tribes to Solomon’s servant Jeroboam, but leaving Judah to Solomon’s son Rehoboam. God told Jeroboam about this through the prophecy of Ahijah the Shilonite. 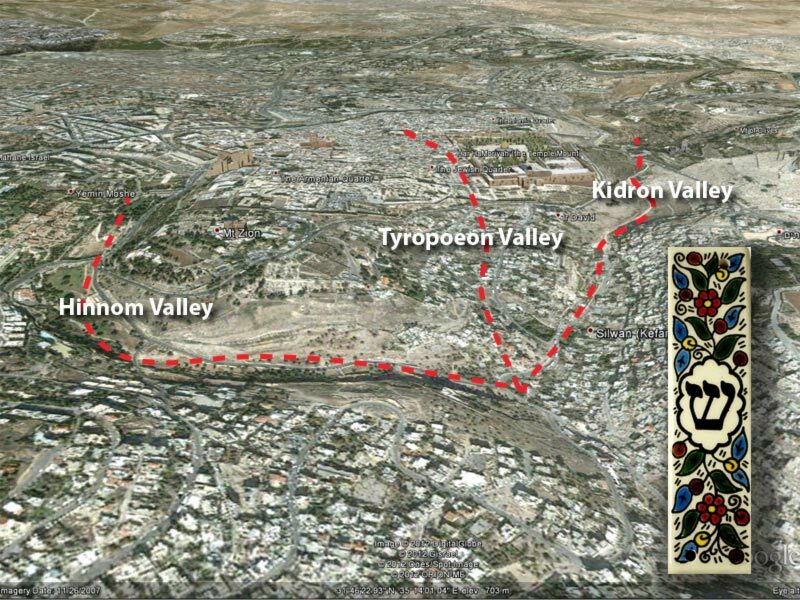 Note that in the middle of the Hebrew name of Jerusalem (יְרוּשָׁלַם) is the letter שָׁ shin.It is interesting to note that the topography of the old city resembles this Hebrew letter. I’m not sure that we should really read too much into that, but it is very interesting. The Hebrews writer continues in Hebrews 7:3, saying that Melchizedek is “…without father, without mother, without genealogy…” Why did the writer consider this fact important enough to mention? To the modern reader in today’s cosmopolitan society, a person’s pedigree is unimportant, but in ancient (and even modern) Hebrew society, it was a big deal. The ancestry of the priests in particular was of great importance. God had ordained in His Law that the priests were to be taken from the descendants of Jacob’s son, Levi – the tribe of Moses and his brother Aaron – and that the high priest was to be chosen from Aaron’s family in particular. Interestingly, modern scientists in the late 1990s discovered a unique genetic marker that descendants of Levi carry. A cursory scan of Chronicles, Ezra, and Nehemiah reveals that a large proportion of those texts is devoted to listing genealogies of kings and priests. In fact, recall that after the Babylonian captivity, the genealogies of some of those returning to Canaan for the rebuilding of the temple could not be proven. Therefore, some of those claiming to be Levites were not allowed to serve in the new temple. In fact, the obsession with genealogies was so strong in Hebrew society that Paul found it necessary to warn Timothy and Titus about it. The writer encapsulates his declaration of the divinity and eternal nature of Melchizedek in Hebrews 3:4-10 which stand on their own without need of further comment. The writer continues in Hebrews 7:11 contrasting once more the corrupt human priesthood of the Levites and the descendants of Aaron, under the Law of Moses, through the blood of animal sacrifices, with the perfect and eternal priesthood of Jesus Christ, by the New Covenant in His blood, shed for all on the cross. The writer has much more to say in the upcoming chapters about the insufficiency of the priestly ceremonies and animal sacrifices of the Levitical priests to provide true and lasting salvation from sin. We will therefore defer discussion of this vital topic until we take up those passages for detailed study. For the time being, suffice it to say (as the Hebrews writer does in Hebrews 7:12) that by the time Hebrews was written, the Levitical priesthood had become so corrupt and ungodly, a “changing of the guard” was needed, and with it “a change of the law.” Nevertheless, we must take care that we don’t read into this the idea that Jesus came to abolish the law, or that the law is no longer valid or relevant. Jesus Himself made a clear declaration to the contrary in His sermon on the mount. Recall that Hebrews 7:1 calls Melchizedek both “king of Salem” and “priest of the Most High God.” No other single person apart from Jesus Himself is called both priest and king throughout the Word of God except in John’s greeting to the churches in Revelation. ​Grace to you and peace from Him who is and who was and who is to come, and from the seven Spirits who are before His throne, 5and from Jesus Christ, the faithful witness, the firstborn from the dead, and the ruler over the kings of the earth. Recall also that the priests were taken from the tribe of Levi in accordance with the law of Moses, but that Israel’s kings were taken from other tribes, never from Levi. The Hebrews writer discusses this point starting in Hebrews 7:13. 13For He of whom these things are spoken belongs to another tribe, from which no man has officiated at the altar. Jesus was born into the tribe of Judah (and specifically into the line if David) in fulfillment of the prophecy of Isaiah. ​​And a Branch shall grow out of his roots. ​​The Spirit of knowledge and of the fear of the LORD. ​​And with the breath of His lips He shall slay the wicked. ​​And a little child shall lead them. ​​And the lion shall eat straw like the ox. ​​And the weaned child shall put his hand in the viper’s den. ​​As the waters cover the sea. Jesus clearly fulfills this prophecy, based on what we know of His character. His lineage of the house of David through His stepfather – Joseph is confirmed by the genealogies of Joseph we find in Matthew and Luke, as well as the well-known verses we find in the nativity story. There have been a good number of words arguing that Joseph’s genealogy is irrelevant, and that therefore one or both of the genealogies we find in the gospels of Matthew and Luke must pertain to Mary rather than Joseph. After all, the identity of one’s mother is never in doubt, while one’s father’s true identity (at least until the invention of DNA testing) remains subject to debate. Indeed, one might well argue that since Jesus is God in the flesh, conceived of His own Spirit and merely born to Mary – the one who carried the child in her womb – Mary’s genealogy is also irrelevant. After all, Jesus couldn’t possibly have had any of Mary’s DNA. Otherwise, He would have inherited from her the sinful nature borne by all mankind since the fall of man in the garden. All of those arguments notwithstanding, however, it is clear that Jesus fulfilled the prophecy of Isaiah 11 along with many other Messianic prophecies found in the Old Testament, when He came in the flesh. So we can safely leave all those genealogical discussions for another time. Although they are entertaining, they are not really relevant to the argument of the Hebrews writer here in Hebrews 7:13-17, nor indeed to the Gospel of Jesus Christ itself, which in the final analysis, we must either accept by faith or reject by our own choice based upon our own individual consideration of the evidence in Scripture. Before we press on though, I would simply admonish the reader that you must make a personal choice, to believe and accept the Gospel that Jesus – God in the flesh of a man – came to Earth, was born of a virgin, died on the cross to take the just punishment of God for the sins of mankind (death) upon Himself, and that He overcame death for all mankind when He rose from the grave on the third day, or to reject it and continue to follow your own path. Take it or leave it, but hear this warning. You must make a choice to believe the Gospel or not. There is no third option. As someone once said, “The devil owns the fence.” Nor can you safely defer a decision. As Paul wrote to the Corinthians (2 Corinthians 6:2) – “Behold, now is the accepted time; behold, now is the day of salvation.” I urge you to make the choice to believe the Gospel and accept the Spirit of God into your heart today… right this moment… while you yet may. ​​Or the wheel broken at the well. Having now established that Jesus is indeed “a priest forever according to the order of Melchizedek” just as King David proclaimed in Psalm 110:4, next time we will take up the study of the Hebrews writer’s exposition of the Gospel and priestly ministry of Jesus itself.